Annella (Fig. 21.18). Members of this genus are large reticulate fans up to 2 m in diameter. The axial skeleton is comprised of gorgonin and partially fused, smooth, sinuous sclerites. Sclerites of the cortex are double discs and spindles. Colour: brown, orange, red or yellow. Uncommon. Similar genera: Echinogorgia and Verrucella. Family Melithaeidae. The Melithaeidae consists of fan-shaped or tangled bushy colonies in which the axial medulla is segmented, comprised of a series of short, rounded nodes alternating with longer, narrower internodes. The swollen axial nodes on the stem and main branches are generally conspicuous, while those at the points of branching within the fan may not be so obvious. 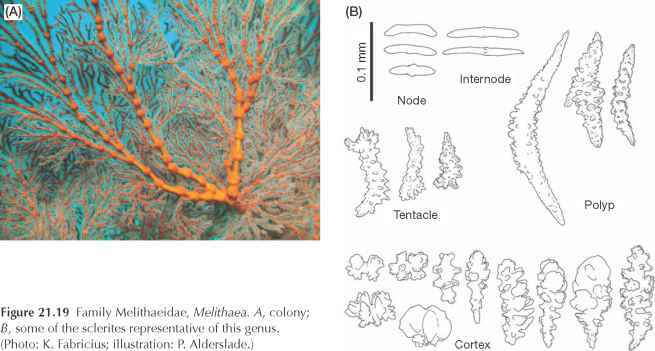 With few exceptions, branching occurs at the spongy gorgonin nodes. Colonies are quite fragile, breaking at node-internode joints. 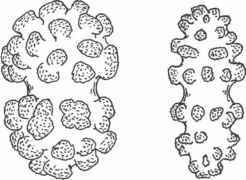 The sclerites are usually coloured, and besides the axial rods they include tuberculate clubs, ovals and spindles with ridges or spines along one side, leaf-clubs, and multirotulates (that look like two or more buns pressed together). The family contains five nominal genera that are not easily distinguished. Melithaea (Fig. 21.19). Small to relatively large fans (>1 m in diameter) that are sometimes reticulate. Members of this genus have an axial skeleton of alternate nodes of gorgonin combined with small rod-like sclerites and internodes of fused sclerites. Cortical scle-rites include birotulates and knobbed clubs. Colour: red, yellow or white. Uncommon but widely distributed. Similar genera: all other members of the family. Family Acanthogorgiidae. Colonies are richly branched, fan-like, net-like, bushy, or untidy and tangled. The most noticeable features are the very conspicuous nonretractile polyps, which are completely covered with straight and curved spindle-shaped scle-rites. These spindles are commonly arranged in eight double rows. Some species have a conspicuous crown of sharp spines around the top of the polyp. Colonies have a black, purely horny hard axis, and a wide, hollow, soft, cross-chambered central core. In some species, the coenenchyme is so thin that the black axis can be seen through it, which can be a clue to their identity; but in others it is quite thick, full of sclerites and opaque. Sclerites are mostly tuberculate spindles, but tripods and capstans also occur. In other genera, however, the coenenchyme is thick, and the polyps can look like the calyces found in the family Plexauridae inside which a retractable polyp can be found. Acanthogorgia (Fig. 21.20). Members of this genus usually have small fans with partial or full reticulation, but are sometimes bushy. The axis is usually black and visible through the thin coenenchyme. 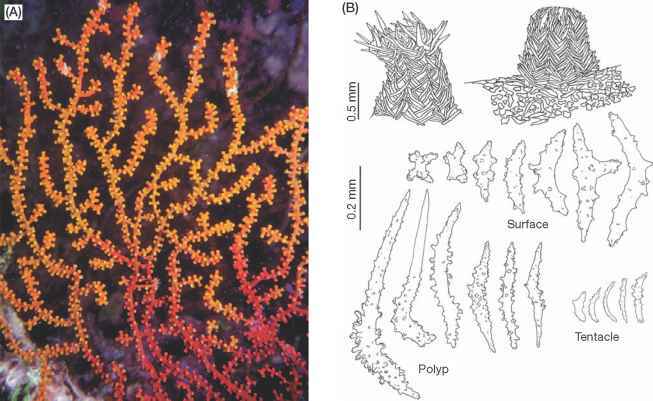 Nonretractile polyps are often very tall, and covered in eight double rows of thin, bent spindles. The distal sclerites often form a spiny crown around the polyp head. Coenenchy-mal sclerites are small spindles and may include thorn-stars and capstans. Colour: bright, often multicoloured. Uncommon. Similar genera: all other members of the family. Family Plexauridae. Colonies in this family are bushy or fan-shaped (often net-like), and are sparsely to richly branched. They have a black to brown horny axis with a wide, hollow, soft, cross-chambered central core, and numerous spaces filled with fibrous cal-cite. The polyps are retractile, often within prominent calyces, and are usually armed with large sclerites in a collaret and points arrangement. Sclerites are often quite large, longer than 0.3 mm, and some as long as 5 mm. They are tuberculate, sometimes thorny, and the tubercles are rarely arranged in regular whorls. Sclerites called 'thorn-scales' often occur in the walls of calyces; these usually have a basal, spreading, root like structure, and large, distal spines or blades that often protrude beyond the rim of the calyx. The scler-ites in the coenenchyme come in a very wide range of forms. Euplexaura (Fig. 21.21). The genus comprises planar colonies, not richly branched, with branchlets usually arising at right angles and then bending upwards. Scler-ites of the thick coenenchyme are plump spindles and spheroids. Colour: white, grey or brown. Uncommon. cross-chambered central core is usually narrow, and the axial cortex surrounding the core is very dense, with little or no loculation. Non-scleritic calcareous material may sometimes be present in the axis. Sclerites are generally small, usually less than 0.3 mm in length. Polyps are always retractile, sometimes into low calyxlike mounds. The polyps may have no sclerites at all, but if present they are generally small, flattened rodlets with scalloped edges. The sclerites in the rest of the colony are nearly always spindles with the tubercles arranged in whorls. Some species have curved, asymmetrically developed spindles. Rumphella (Fig. 21.22). Colonies are bushy, often with a large, calcareous holdfast. Polyps are very small and retractile into the thick coenenchyme. Calyces are absent. Sclerites are symmetrical clubs and spindles with the tubercles in girdles. Colour: brown to greenish-grey. Uncommon, but widely distributed. Family Ellisellidae. 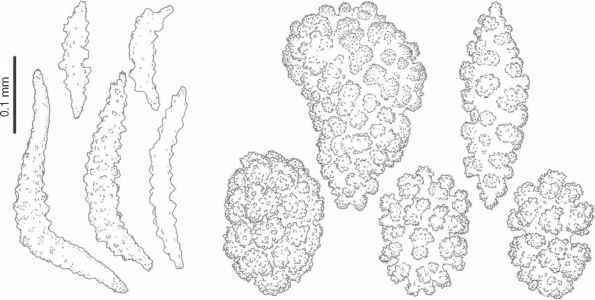 Colonies have a strongly calcified, continuous axis, and can be unbranched, loosely branched, or form broad, flat fans that may be net-like. 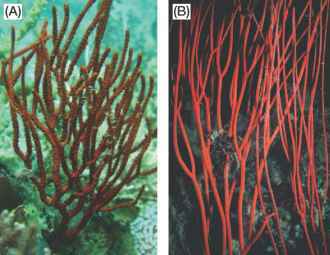 It is very important to note the way a colony branches, because genera with the same sorts of sclerites can be distinguished based on growth form. Polyps are highly contractile, but not retractile. 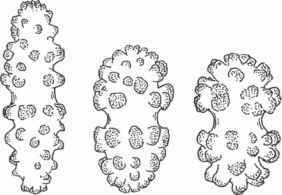 When contracted they may fold over and lie against the branch surface, or just close up to form a small mound, which may look like a calyx. The major feature of this family is the characteristic form of the tiny sclerites, which are shaped like clubs, double heads and spindles with distinctly separate, papillate tubercles. There are also capstans with cone-like processes. Ellisella (Fig. 21.23). Colonies are bushy, with whiplike branches, repeatedly branched in a dichotomous manner, generally <0.7 m in diameter. 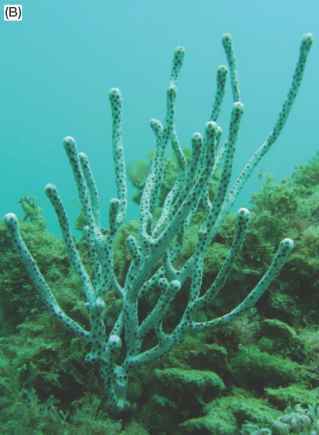 Polyps are not retractile, usually folded up against the branch surface. Sclerites are double heads and waisted spindles. Colour: red, yellow or white. Uncommon but widely distributed. Ctenocella (Fig. 21.24). Members of this genus have comb- or lyre-shaped colonies that can grow to >1.5 m in size. Otherwise they are the much the same as Ellisella, although the waisted spindles are very short. Colour: red (usually). They generally occur in low light. Junceella (Fig. 21.25). Unbranched whip-like colonies up to >2 m in length, occur in this genus. 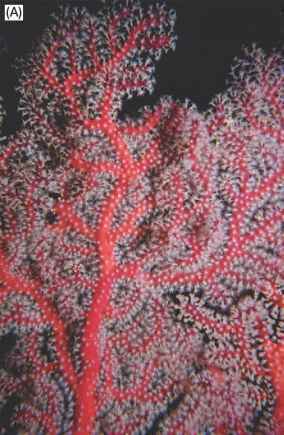 The polyps are not retractile, usually folded up against the branch surface. Surface sclerites are clubs, subsurface sclerites are double stars. Colour: white, cream, yellow or red. Members of this genus are occasionally found in dense patches, and are quite common and widely distributed. Similar genus: Viminella. they are hollow, but this tubular nature is not to be confused with the soft, cross-chambered central core of the holaxonians. Internodes can be coloured, and although they may be quite smooth, they are often ornamented with prickles and ridges. 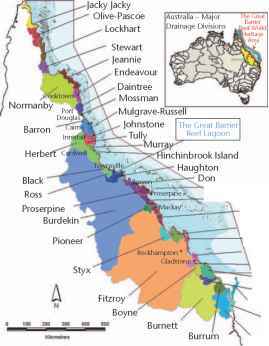 The nodes that alternate with the internodes consist of pure gorgonin. Colonies can be whip-like, but are usually profusely branched, bushy or fan-like, but rarely net-like. Polyps can be retractile or non-retractile. If non-retractile, they are commonly covered with broad scales, narrow rods or needles. 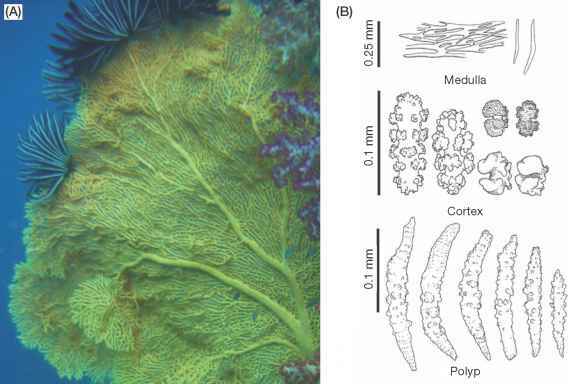 If retractile, the polyps either have no sclerites or are armed with spindles in a collaret and points arrangement. Sclerites in the rest of the colony can be of many forms. The majority of species in this family are deep-water inhabitants; Isis hippuris and Jasminisis cavatica are the only species found in shallow waters of the GBR. Isis (Fig. 21.26). Members of this genus are planar to bushy, generally 20-40 cm tall. The axial skeleton consists of alternating horny nodes and non-spicular, opaque, solid calcium carbonate internodes. Polyps are small and retractile into a very thick coenenchyme containing abundant sclerites in the form of capstans and clubs. Colour: bright yellow to green or brown. Common in clear waters. Similar genus: none.